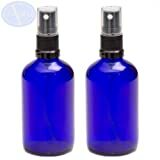 PACK of 2 – 100ml BLUE Glass Bottles with Black Atomiser Sprays & Clear Caps. Dark Glass Bottles are used to store Essential Oils / Aromatherapy Blends as they protect the oils from sunlight, helping to keep them fresher for longer. We stock a large range of Pure Essential Oils and related Aromatherapy Products – Please visit our storefront for more information.